I remember walking to Moreton Cross with my mum to catch the 77 bus to Landican Cemetery on the Wirral. I guess we went once or twice a month. Mum knelt on an old towel clearing weeds and trimming the edges of the flower bed that marked Aunty Mary’s grave. I was off running between the headstones with my invisible friend, Ben – like Calvin and Hobbes. Neither Ben nor I ever stepped on a grave. The souls might have ascended to heaven but the interred bodies had to be respected. Back from my imaginings I’d find mum silently weeping. I hugged her so hard thinking how she loved her older sister. Only recently did I discover that Mary was, in fact, her mother. Cemeteries house the dead, their neat avenues and walkways are like miniature housing estates. A reverential solitude accommodates remembrance, grief and, on occasion, celebration of a life well lived. Having renewed the flowers on Mary’s grave we would drop by the ice cream shop and take the bus home. As an altar boy in a Catholic family I regularly served requiem mass and stood alongside numerous gravesides. I suppose I accepted memorialisation as part of life. Death was not an end, but a beginning. Not a proposition that endured into my adult life! Living in Belfast memorialisation is highly visible – gardens of remembrance, mural dedications to those killed in the Conflict, plaques at the site of shootings and bombings. The Ormeau Bridge above the River Lagan was a persistent flash-point throughout the Conflict separating the Loyalist Annadale estate south of the river from the Republican Lower Ormeau to the north. 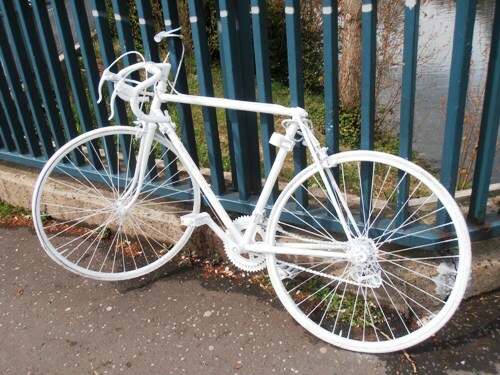 One morning over a year ago a ‘ghost bike’ appeared on the bridge – a bicycle painted white and chained to the railings. People paused as did I, smiling and curious. Our light-heartedness was soon replaced by a more sombre and compassionate reflection. The inscription read: Michael Caulfield, 56 R.I.P. 15 April 2011. The impact was immediate. He was unknown to most who passed by, yet his death was shared, his life memorialised. Knocked from his cycle by a delivery van, Michael Caulfield’s death was a poignant reminder of our vulnerability – in a moment our lives can be transformed by tragedy. Initially taken aback, his family welcomed the memorial. Walking from the bridge I recalled driving the N6 between Dublin and Galway in the mid 1970s. Narrow, winding and poorly maintained it linked Ireland’s major cities. On both sides white crosses provided a constant reminder of the many lives the road had claimed. They stood as memorials but also were warnings. Since then it has become usual for deaths of pedestrians, particularly children, to be marked by toys, football shirts, scarves, photographs, poems and plastic flowers tied to lamp-posts or railings. Impromptu dedications appear at sites of tragedies often replaced by more permanent memorials. 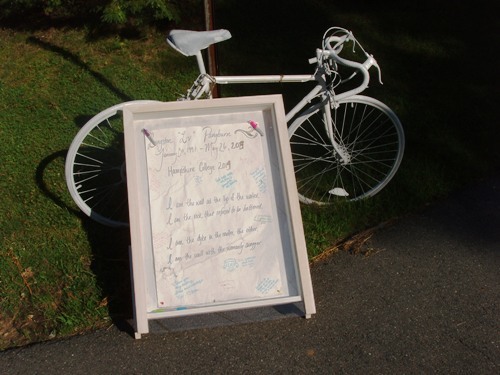 The ghost bike has become a universal symbol of remembrance. Its origin is attributed to Patrick Van Der Truin who put a white-painted bicycle on a street in St Louis, Missouri where, according to the hastily written sign, a cyclist had been ‘struck’ by a car. Relatively quickly across the USA the practice was adopted to become a symbol of memorialisation for those killed while cycling. A few weeks ago a ghost bike appeared on a busy road through the Amherst College campus, Massachusetts, where I’ve been working. On a late May Sunday afternoon, Livingstone ‘Liv’ Pangburn, a talented local student at Hampshire College had been hit by a truck while cycling. His friends had attached a message board for people who knew Liv to leave their dedications. Thinking aloud, I suppose I’m making a connection between the formal, planned place of remembrance I visited as a child – the cemetery – and the sites of tragedy spontaneously memorialised in communities, on roadsides, on mountains, and so on. They remind us to pause for thought, to connect to a person we never knew and, perhaps, to discover more. In their simplicity they confront us at the site signifying what Susan Sontag names ‘the pain of others’. The informal memorialisation of the lives of ‘others’ will be controversial, dismissed as an unwanted imposition on the lives of ‘us’. Hopefully, as was the case with Michael Caulfield’s family, through public recognition of the death of a loved one bereaved families will feel supported by the community. It is not an acceptance, however, to be taken-for-granted. This entry was posted in Memory, Reflections on July 17, 2013 by Paul Scraton.